Everyone who knows me knows that I am a sucker for shoes. My theory: you can put on weight and your outfits might not fit you anymore but shoes my darlings, shoes fit you the same no matter how much you change in shape and size. Though honestly, I used to wear 5-inch heels 2-3 years back because it was habit you see. I was a short-ish person so it was part of me. I spent money on designer shoes, had 2-3 colours of the same shoe and wired my brain to run after a new heel every 3 months or so. But really, after the baby, you know one cannot wear heels and run. OMG with the baby, a baby bag and tired feet, it was an impossible thought. I desperately wanted to be that mom on Park Avenue running with heels, catching a cab, holding a baby in arm and winking away to us – the kind you see on book covers in pink. Yeah, not me at the moment. And so while I gave away all of my heels to cousins and friends ( some BFFs borrowed and promised to give them back someday), I kept a few for myself. One day, I told myself, one day I would wear them again. My nice ASOS boots I bought to fight Delhi winters (ah, Mumbai makes you look wannabe in boots, not Delhi, Delhi makes you look like you have business to take care of!). My sweet Guiseppe Zanotti with the zebra-print and the pencil heel (which I bought when I was most broke, I saved up like mad for it) and the sweetest Zara powerhouse heels I found in the likeness of a certain Jimmy Choo. And as I thought about shoes today, I realised that when it comes to Indian wear, I hardly know which shoes to step out in. I have my trusted gold slinky Manolo-inspired stuff I bought at South-Ex and my nice jhuttis. While they fall on the two ends of the spectrum, I don’t know if there is another luxe offering wedged right in the middle. The one you wear to a party, or a Mehendi or for a formal-ish dinner. You know a sort of Kate-Spady range of Indian shoe that structures itself right between Monolos and Hill Road. 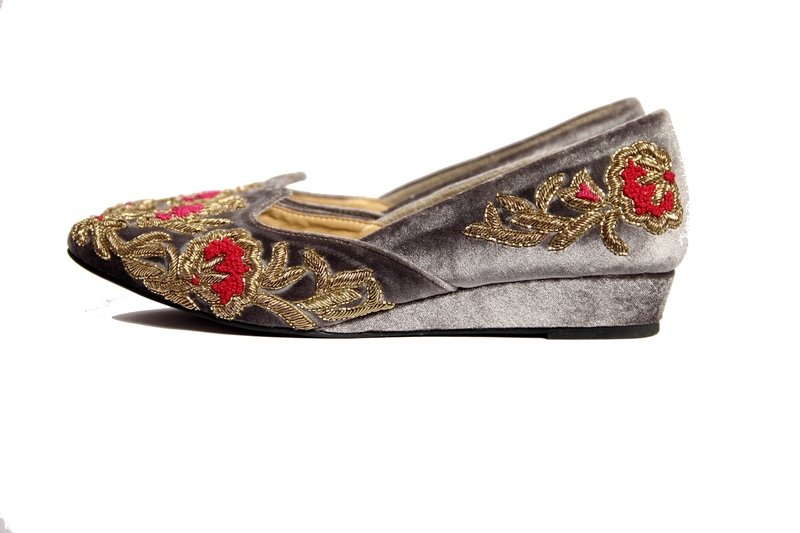 And one day, as I casually bouncing off websites and putting a few things on virtual carts, I found a glimpse of something that resembled a beautiful slipper with such pretty embroidery – fit for a modern day queen. Jewel tones, handcrafted feels and so chic. Little clicks and a lot of snooping led me to RUNGG. The place Aladdin and Jasmine go for a spin, I guess before they attend a wedding. So I reached out to the guys over at Rungg and got to know all there is to know about their design philosophy, their passion and those pretty little shoes with a story to tell. Well, there’s something special about these shoes too: they are cruelty-free and vegan. As a person who is slowly moving towards a more slow-paced fashion life, this one’s an interesting fact. I spoke to the founder, Ekta Sethi and here’s what she had to say. Rungg means color and our design philosophy is pretty simple – create that, which has life far past the current trend, that, which is timeless. I find my inspiration in nature – be it color, form or pattern. A Rungg shoe cannot be possible without color and rich embroidery. Tell us why Rungg is such a delight to wear? When you purchase a Rungg shoe, you’re not just buying a Shoe, you’re buying a piece of art. Our shoes are completely handcrafted, with each pair being hand embroidered with age old craftsmanship on cruelty-free vegan materials. Our designs are unique and no two shoes are the same, variations in color, make and embroidery ensure a one-of-a- kind product for the wearer. Our double-padded insoles are designed to provide superior comfort and our signature wedge heel provides an ergonomic posture for your lovely feet. Having lived in USA for over a decade, I wondered why there can’t be a shoe that is stylish yet comfortable, that marries the present and the past; that is majestic yet relaxed and Rungg happened. What are your new collections? We recently introduced stilettos/scarpin as a totally new silhouette and will be launching new designs with metal sequins by the end of this month. Favourite popular shoes – from your collection? Most of our shoes are buyer favourites 😉 Depending on your mood, there is an option for either the rich traditional, fun and eclectic or the night out. Two of our signature designs are the Gold bloom and Red Valentine. Both a marvel of artisan craftsmanship – the embroidery alone on these shoes takes around 14 hours to craft. With Gold Bloom, our artisans have taken the needle and thread to another level with this design – lovely blooms fall across the front and around. Colours of gold, burgundy, and pink come alive on the velvet satin material. Love, Passion, Power and Romance are some of the emotions that have inspired the Red Valentine. The black base illuminates this wonderful artwork in red threads and white beads. As for my favourite – it’s the grey velvet shoe with that beautiful red and gold work – The Gold Bloom and the Pink Flamingo isn’t for the faint-hearted either. Sigh! And these babies are priced from Rs 4000 onwards and available here. Previous What is Rock Salt? Next Vintage Shoot, Indian Wear: Loving The Contrast!